Teldio’s Email Gateway connects mobile workers to administrators, other departments, and users outside of the radio network. 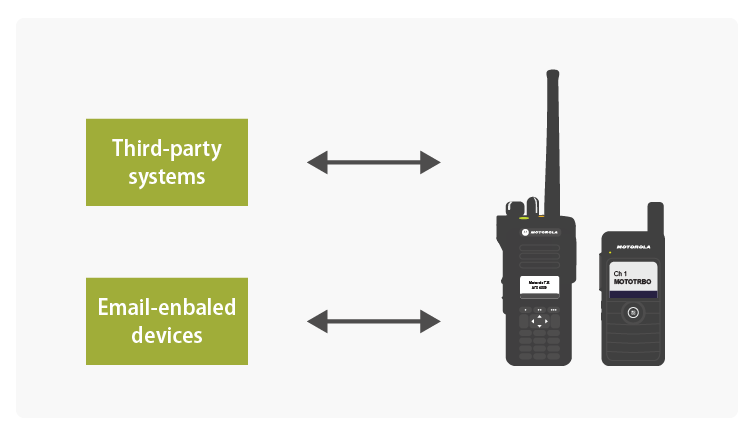 The Email Gateway allows two-way radios to send and receive emails directly from the radio handset and integrates third-party work management systems to the radio network to send work orders directly to radios. Workflow task management becomes streamlined with the Email Gateway. Email Gateway allows dispatchers, supervisors, and administrators to send work orders to MOTOTRBO radio users and groups through the work management systems. Email Gateway integrates into most third-party Work Management Systems such as HotSOS, SynergyMMS and Guestware, Starguest. Easy to install on any PC on the LAN network, Email Gateway’s user interface is clean, intuitive and easy to use. Users can send and receive emails directly from their radios with Email Gateway. This allows for radio users to leverage data applications and communicate freely with other members. Radio users can send and receive emails (up to 275 characters) directly on their radio. Emails are sent to a radio user’s email account, forwarded to the server and dispatched to the radio(s) via the two-way radio network. Option to send emails to a radio user’s email account, set up as a dedicated email account per radio user, or as an alias address for a single email account. A catch all email is not a requirement. Email Gateway increases productivity by allowing dispatchers and supervisors to send work tickets to radio users by integrating to third-party work management systems. With Email Gateway, mobile workers can be alerted in case of an imminent danger, accident or event. Mass notifications can be sent to all assigned users, a group of users and individual users. Further leverage the value of your MOTOTRBO radio network with Email Gateway. Eliminate communication barriers between mobile workers and the rest of your workforce. Email Gateway is housed on a server that is connected to the MOTOTRBO radio network via a direct repeater connection or control stations. If using control stations in conventional modes, the system requires one control station per repeater slot. In trunked environments, the system requires only one control station. Email Gateway can have an unlimited number of users. The Email Gateway allows two-way radios to send and receive emails directly from the radio handset and integrates third-party work management systems to the radio network to send work orders directly to radios. Can work alongside any system that can send and receive emails.